Our readers are all over the world but Tech Age Kids is actually based in the UK. It's a pretty awesome place to be for Kid Tech. This week we're off to the UK Toy Fair and the BETT Educational Technology conference. There will be lots of international exhibitors, but it's also a chance to catch up with some of our local industry friends and hopefully meet some new ones. 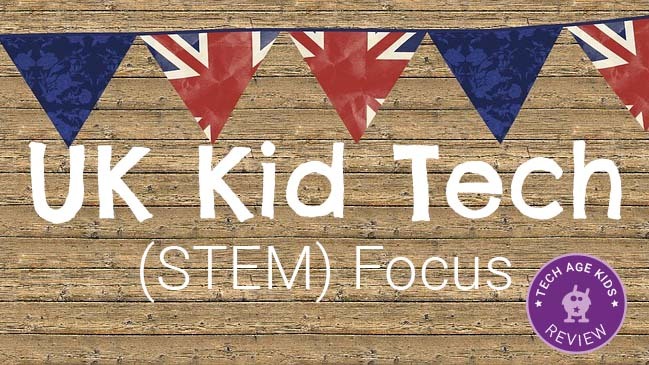 We thought it was a good time to write a round up of UK-developed products that help kids learn about and make stuff with technology, or use the latest cool technology and robotics. Our focus is on tech for use outside school in homes, maker spaces, libraries, clubs and camps rather than edtech for schools. The list isn't exhaustive. If there are more products you think should be featured here then do let us know. The Raspberry Pi is a small affordable computer that kids can use to learn coding, electronics and digital making. There are loads of resources, accessories and kits that can help families get started with the Raspberry Pi. The success of the Raspberry Pi has lead to lots of companies that build on the Pi including many UK ones such as FUZE and Pi-Top. The BBC micro:bit is a small programmable device that can be used to create gadgets and wearables. It can be programmed using visual drag and drop languages or text-based Python. The micro:bit is packed with sensors and has an LED matrix and input buttons so it doesn't need any extras to make a cool project, but there's loads of scope for extensibility too. See our micro:bit Egg Hatcher for an example of the kind of projects you can make with a BBC micro:bit. Tech Will Save Us make fantastic technology kits for children. Their kits are self-contained and are great for families that want to get hands-on with tech but don't want to have to source a set of compatible parts for projects. Tech Will Save Us kits cover a wide age rather from preschoolers through to teens ready to solder and code with Arduino. We've previously reviewed their DIY Gamer Kit, DIY Synth Kit, Electro Dough Kit and Mover Kit. Sam Labs is a range of small wireless rechargeable electronics components that can be used to make awesome inventions. We made a fun Minecraft Sword and a simple Light-Up Colour Changing Balloon. But honestly, my eight year old has the most fun when you just charge up the SAM Labs and give him a pile of junk. He makes things that have absolutely no practical purpose, but he's learning useful stuff and feels completely comfortable with using tech in his play. Hackaball is a programmable, throwable toy from Made by Many. It's awesome. Hackaball lights up and plays sounds and has movement sensors. It's really popular with my 8 year old son. He's loving creating his own games. My 10 year old loves it too. He's a stickler for games having well-defined rules and Hackaball is on his side. Check out our Hackaball review for more details. Unfortunately you can't buy a Hackaball at the moment but hopefully there will be another production run soon. OhBot is a fantastic robot head with lots of sensors for movement. OhBot is programmed using a block based application and uses a camera (which can be the one on your computer) to detect faces. OhBot also makes use of speech synthesis and voice recognition. OhBot is fab for getting kids thinking about the human interaction side of robotics. And ours makes a fantastic assistant when we're at events. The Cubetto robot from London-based Primo enables screenless coding for young children. Cubetto is a wooden floor robot with a programming board. Kids place shaped tiles on the board in a sequence to create code that controls Cubetto. It's a beautifully designed product that parents will enjoy sharing with their kids. Check out our Primo review and free downloadable Cubetto costume templates - Cubetto is just asking to be dressed up! Marty is a programmable walking robot from Robotical, based in Edinburgh. Marty's parts can be 3D printed and the robot will be programmable in Scratch as well as languages like Python and C++. Marty had a successful Indiegogo campaign and is now in production. UK-based Data Harvest make educational technology products and recently they have provided the tech for the new K'Nex Education Robotics kit which allows you to build and program lots of very cool robots. Check out our review of K'Nex Robotics for more details. Simbrix are small building blocks that can be used to make pixel art models that stay together. Simbrix are a really useful construction toy for makers to have around and they are brilliant for using in stop motion animation. We used Simbrix for our pixel art advent calendar. Mardles created products for kids using augmented reality technology. They have a range of AR stickers and colouring books that come to life when used with the Mardles app on a smart device. And Mardles have just announced a new Mardles 3D books with pages that come to life with AR technology so kids can interact with the content. Bare Conductive make electric paint and the fab Touch Board which allows you to create interactive art that uses touch and sound. You can also use their electric paint in kits to make cards, cardboard houses and other projects. We first came across the company at a Brighton Maker Faire several years ago. Pimoroni make and sell lots of cool electronic stuff, we backed their Flotilla electronics for the Raspberry Pi kit on Kickstarter and to a beautifully designed box of gorgeous components and projects. A great way for kids to get started with electronics on the Pi. We used Flotilla in our realworld Minecraft furnace project. Reach Robotics are based in Bristol and are developing very cool robots that can be used in AR games. Reach Robotics demoed their new MekaMon gaming battle bots at CES this year. We think they're on the right track - gaming is increasingly heading into the physical world. The KANO Kit is a Raspberry Pi-based computer kit that kids can assemble themselves. There's also the free KANO operating system which has lots of kid-friendly software to teach kids coding and electronics. KANO are also launching Pixel Kit, Camera Kit and Speaker Kit add-ons to get kids (and beginners) started with physical computing. Code Kingdoms is now focussing on subscription based Minecraft-modding courses for kids. Their courses include video content and use an online graphical editor which maps to real Java code. Kids get to learn real coding concepts without having to worry about syntax errors. Erase All Kittens is an online game that teaches kids about HTML & CSS, the languages used to write web pages. It's weird in a good way. We've been using and recommending the EAK demo for a while so we're pleased to see that Drum Roll HQ have released a paid version with lots more content. Beasts of Balance is a rather awesome new family game from Sensible Object. Our kids really took to this game. You balance physical game pieces including gorgeous animals on an electronic plinth to build a fabulous world in the accompanying app. It's a great mix of the physical and virtual. Quirky and very well designed. Check out our Beasts of Balance review. Lightseekers is a new toys to life and trading card game from Cambridge based PlayFusion. The Lightseekers game is a story led action and adventure RPG can be played on mobile devices and PCs. The connected toys have 2-way digital-physical interaction and the collectible cards offer AR experiences and in game rewards. Lightseekers is set to launch in 2017 and we're looking forward to it. The Crafty Robot is powered by the Fizzbit, a rechargeable module that can be used in paper and 3D printed crafts. They provide templates you can print on paper or even a 3D printer to which you add the Fizzbit. The idea is that you can get creative and crafty with technology. The Fizzbit doesn't need a battery, and is simply charged through the USB port on your computer. The fun only lasts a minute or so, but it's still a really inexpensive way to create with tech. We love that you can see the circuit board too. Check out our Fizzbit Spider for Halloween. Curious Chip, previously known as This is Ada, is developing an interesting device for kids learning about programming and electronics. We first met the team behind Curious Chip at the Brighton Maker Faire. Their last product wasn't quite right and they have pivoted to something we think you're going to like very much. More news coming soon.